Ok so the good news is that DINR does work for day of reservations at Joe Beef. Bad news is that my friends and I only had a so-so dinner. I'll post in a little more detail later. I'll post more about what we ate (a lot), but this was one of our most fun and delicious meals in a very long time. Wonderful service, convivial atmosphere, comfortable, great food, nice wines btg suggested for all the different stuff we ate. And this all after arriving close to 1/2 hour late - who knew traffic in Montreal would be so bad?! Work on the 720 and turcot has made getting any place in saint-henri/little burgundy hell. That also doesn't include all the other seasonal roadwork going on in the city. I usually walk there (unless it's like negative 50 F). We did a minimum 4 mile walk (so far) today. @ori & @Patrick - yeah, even our cab driver(s) was (were) aggravated. And talked a lot about all the construction nightmares. 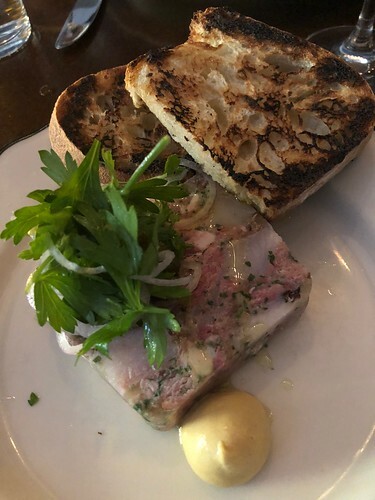 One of our 4 starters was this terrine of jambon and silvertail (aka mackerel), that absolutely knocked it out of the park. And those smoked meat croquettes that Daniel qvelled about above? Well, they were pretty great too. Last time it was raining when we left and I'm pretty sure the Uber driver was trying to use the 50 minute crawl to Mile End to recruit me to ISIS. Omigod I want that terrine. They do talk a lot here. Skate wing "schnitzel." Fantastic frying. 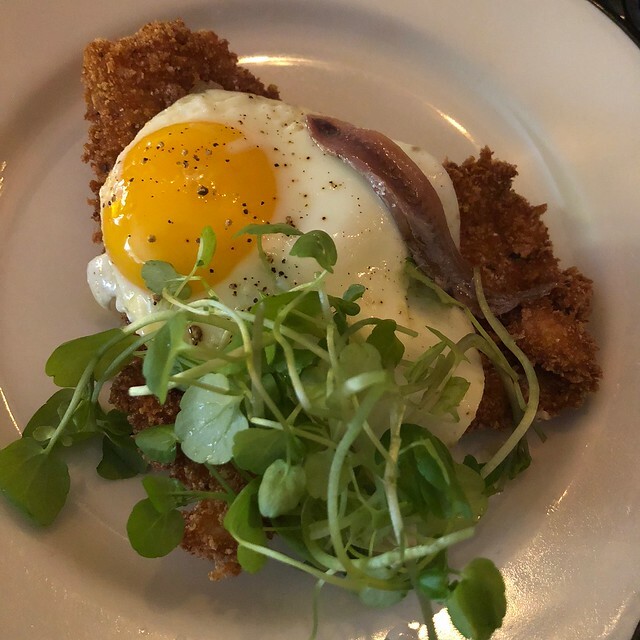 Underneath the schnitz is a dice of cornichon & capers, which when mixed with the fried egg and anchovy...well, you get the picture. david mcmillan on joe beef, excess and sobriety. hoping to eat there again this june. Overweight alcoholic chef who likes to party being told by doctors his liver is competing with his heart for first to explode, decides he loves his family too much and goes straight. Not exactly man bites dog. He's not at the restaurant very often these days, which I'm sure helps. Shades of...well, lots of chefs, that's for sure.